The Israel Defense Forces (IDF) and Palestinian Islamist group Hamas have opened a new front in the propaganda war, via Twitter. On Wednesday, the IDF began live-tweeting and blogging about its current military operation against Hamas in the Gaza Strip. Ahmed Said Khalil al-Jabari, head of Hamas' military wing, was killed in the initial air strike. 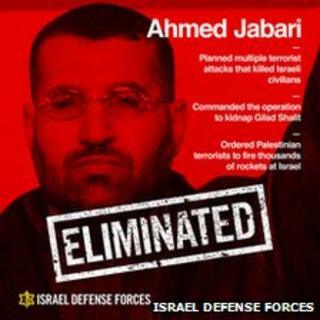 The IDF uploaded a video of the attack and an "eliminated" poster on Twitter. Izz al-Din al-Qassam Brigades, the armed wing of Hamas, responded: "Our blessed hands will reach your leaders and soldiers wherever they are (You Opened Hell Gates on Yourselves)". In a thinly-veiled threat, the IDF warned: "We recommend no Hamas operatives, whether low level or senior leaders, show their faces above ground in the days ahead." Meanwhile, over the last 20 hours, Hamas has been giving a running commentary on its mortar and rocket attacks on various Israeli targets, including what it said were military bases. On Thursday, it posted a YouTube video purportedly showing the launch of a Fajr 5 missile towards Tel Aviv for the first time. In its turn, the IDF tweeted a link to a video purportedly showing an Israeli air force attack on a "rocket warehouse in #Gaza", on day two of its "Pillar of Defense" operation. The use of social media to announce and comment on military operations, almost in real time, is a significant departure for the social networking platform. And it potentially brings the warring parties into conflict with Twitter's own rules, which state: "Violence and Threats: You may not publish or post direct, specific threats of violence against others." Benedict Evans, analyst at media research company Enders Analysis, told the BBC: "This clearly puts Twitter in a difficult position. They want to preserve their position as a carrier service that doesn't editorialise. "On the other hand, they have terms and conditions that must be adhered to. "This is not a decision a couple of hundred engineers in North California want to be making." It remains to be seen whether Twitter intervenes in the online warfare and bans either or both of the combatants.